What does new learning look like? Come and see in action on Stand 1! The 6th-graders are in the limelight in this modern learning environment in which the students learn about entrepreneurs on the fare and contact them virtually outside of the fare by using Skype. Visitors can walk in the space, observe, ask and bring the best practices into their own work. 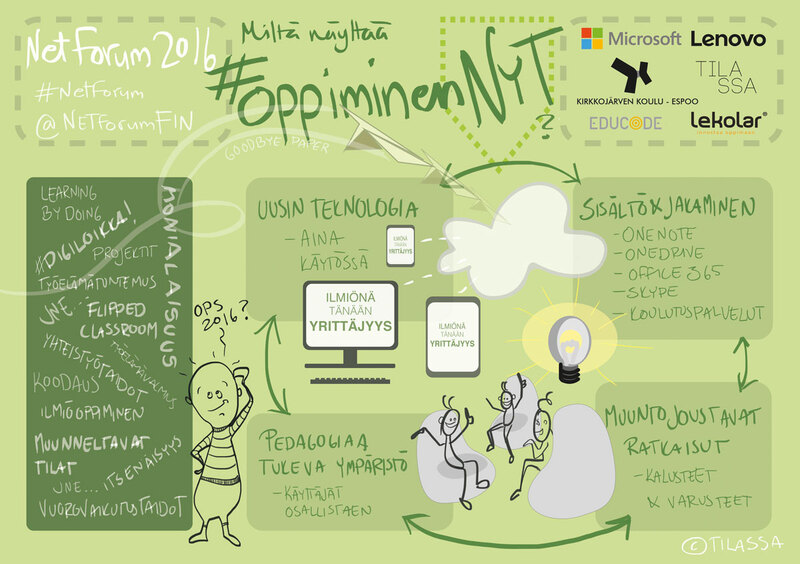 The experimential #OppiminenNYT (“#LearningNOW”) stand welcomes all visitors directly after entrance. The modern learning environment includes learning solutions by Microsoft (Office 365, OneNote and Microsoft cloud solutions), Lenovo’s ICT-technologies (including Lenovo LAN School, smartphones, tablets, laptops and servers), Lekolar-Printel Oy’s adaptable learning space solutions (furniture, decor, teaching tools), Tilassa Oy’s interior design based on pedagogical learning processes and Educode’s learning and teaching training-, consulting- and development services. Get the latest news on work and learning environment trends directly to your email! Will the new curriculum make everyone “a straight-A student”?